Product prices and availability are accurate as of 2019-04-17 14:17:36 EDT and are subject to change. Any price and availability information displayed on http://www.amazon.com/ at the time of purchase will apply to the purchase of this product. Shipping List 1Kit 3d Printer(self-assembly about 10 minutes) 1Kit Workbag 1PCS 8GB SD card 200g Environmentally friendly PLA 2. Technical advantage Characteristic: Industrial Grade 3d Printer. Print resolution: +/-0.1mm, It will be tested for 10 hours before shipment. Fast Self-assembly: It just needs to Install the Z-plane kit on the XY plane about ten minutes , Portable/ Simple and convenient. Product forming size: 300*300*400mm. Metal plate: Solid and durable/ Low resonance. 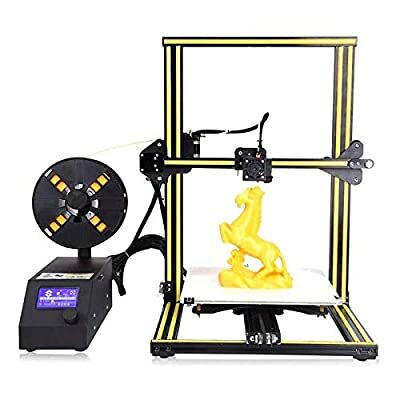 Shipping List 1Kit 3d Printer(self-assembly about 10 minutes) 1Kit Workbag 1PCS 8GB SD card 200g Environmentally friendly PLA 2. Technical advantage Characteristic: Industrial Grade 3d Printer. Print resolution: +/-0.1mm, It will be tested for 10 hours before shipment. Fast Self-assembly: It just needs to Install the Z-plane kit on the XY plane about ten minutes , Portable/ Simple and convenient. Product forming size: 300*300*400mm. Metal plate: Solid and durable/ Low resonance. high-quality nozzle: Avoid scalding injury/ scratches/Electric shock. Unique extrusion structure: Supports more than 10 kinds of printing materials. Linear bearing system: High precision/ Good stability/Low noise. Import T screw rod and PCB higher accuracy; Patent V slot, wheel, more stable and noiseless. Main Functions Model CR-10 Printing Software Cura/Repetier-Host Software supporting PROE, Solid-works, UG, 3d Max, Rhino 3D design software Supports(OS) Windows/Linux/Mac/XP File Types STL/OBJ/G-Code/JPG Software Language English Frame & Body Imported V-Slot Aluminum Bearings Layer Thickness 0.1~0.4mm Input Support SD card/USB LCD Screen Yes printing speed less than 200mm/s Printing Technology FDM (Fused Deposition Modeling) Positioning Precision: Z axis 0.0025mm,XY axis 0.015mm Nozzle Diameter 0.2/0.3/0.4mm (default=0.4mm) Nozzle Temperature: PLA: 180-220 degrees Celsius Hot Bed Temperature PLA:50-60degrees Celsius Hot Bed Material 3mm Aluminum substrate, Tempered glass forming platform Technical Support (1) Products from the factory to provide one year warranty after sales and technical support. (2) free English manual, Software and video can be available.